Flame on, Olympic fever. Just months after we shared the thrills and chills of Park City’s Winter games, San Francisco is hot to host the summer games of 2012. Pardon me if I yawn. Sure the games will be good for Bay Area business, and Oakland will get some of the spill over. But the summer games seem tame to me, compared to the teeth chattering, bone chilling fun you can have in winter. I know this first hand, having just returned from Park City and the site of the 2002 winter games. Just a 90 minute Southwest Airlines flight from Oakland, Salt Lake City is a breeze to get to. Hop on a shuttle and 45 minutes later you’re in the Wasatch Mountain Range and surrounded by 7 of the west’s most popular ski resorts. Olympic Park should be your first stop. For 7 dollars a person (kids and seniors are less) you can tour the site of last winter’s Olympic bobsled, luge and skeleton competitions. You can watch world class Nordic ski jumpers train year round. You can even try jumping yourself, with camps that range in price from 75 dollars (1-day) to 300 dollars (6-day). You start off doing flips on a trampoline, and then graduate to flips off a little ski ramp and into a big pool of bubbling water. The bubbles break the fall, providing a cushion for jumpers who hit the water, arms flailing and skis akimbo. That would be me. In an era where Americans keep pushing themselves to try new experiences, ski jumping is not all that extreme. But what about bobsledding? For 80 dollars, you can go down the Olympic bobsled run. This is not for the faint of heart. It is the most violent, jaw-dropping, bone knocking ride you can imagine. And at speeds of up to 70 mph, it’s a blast. Totally unrealistic, though, if you’re thinking of someday competing in this event. Bobsled training starts early – in those formative years when kids are fearless. Not appropriate for an aging boomer. For us – the Skeleton is a better choice. This is an event you can actually learn in one inexpensive training session at Olympic Park. Really! They outfit you with a special suit, a heavy duty helmet and sled – just like the “big dogs” use. Block out the fact that your face is an inch from the ground as you fly on your belly around hair pin curves. That’s what the chin strap is for. If all this is too extreme for you – there are other options. I took the most gentle hot air balloon ride on my visit to Park City. We glided gracefully on pockets of air, over rolling fields of alfalfa. It’s a breathtaking way to see the mountains and valleys around Salt Lake City. If mountain biking appeals to you, but you’re a little apprehensive about it – try Deer Valley. Unlike other resorts, they offer a 3 hour clinic that teaches you those subtle little nuances of the sport, like how to use your brakes so you don’t fly over the handlebars. They rate their trails here, and by the end of your clinic you should be ready to load your bike on the chair lift and traverse down an intermediate ski hill. Only the mad bombers go straight down – and they’re covered in padding from head to toe. Then there’s the Alpine Slide at nearby Park City Mountain Resort. Much like a bobsled run with built up sides and straightaway, you take your sled up the chairlift and put it down on a specially designed track. You control the speed and fly around the corners as fast or as slow as you dare. At 9 dollars a pop, this is a wild ride that adults and kids can enjoy on the ski hill in summer. 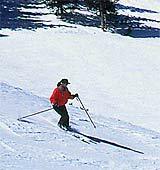 The 2002 Winter Olympics have forever changed Park City and its surrounding area. They have world class training facilities now, which American athletes will use for decades to come. We can use them too – making Utah one of the best family vacation destinations in any season. Very informative post. I’ve found your site via Yahoo and I’m really happy about the information you provide in your posts. Btw your sites layout is really messed up on the Kmelon browser. Would be cool if you could fix that. Anyhow keep up the good work!